Happy New Year! In the spirit of adventure, and trying new things, let’s drive west of Chapel Hill to visit Saxapahaw, NC. Saxapahaw is a happenin’ little hamlet with music (The Haw River Ballroom in Saxapahaw’s Historic Cotton Mill), a seasonal farmer’s market, and locavore food that garners the attention of The New York Times, Gourmet Magazine, Garden & Gun Magazine. Today’s venue, Saxapahaw General Store, was most recently praised in the January 2015 issue of Our State Magazine. GF Menu: Yes! You can view the Breakfast, Lunch, and Dinner with a multitude of delicious GF options on their website. You can order a GF omelet with a side of GF toast for breakfast. At lunch, there are GF pizzas, salads, and sandwich options with GF bread. The dinner menu changes daily, but one standard you can always rely on is the GF pan-seared fish with risotto and asparagus. What I ate: GF pan-seared fish with veggies. How to order it: The online menu is clearly marked with [GF] next to appropriate items. The daily menu is written on a chalkboard. If it is not clear what items are GF, be sure to ask the staff for their GF recommendations at the counter where you place your order. The staff are friendly and knowledgeable foodies, so will help guide you in the right direction. 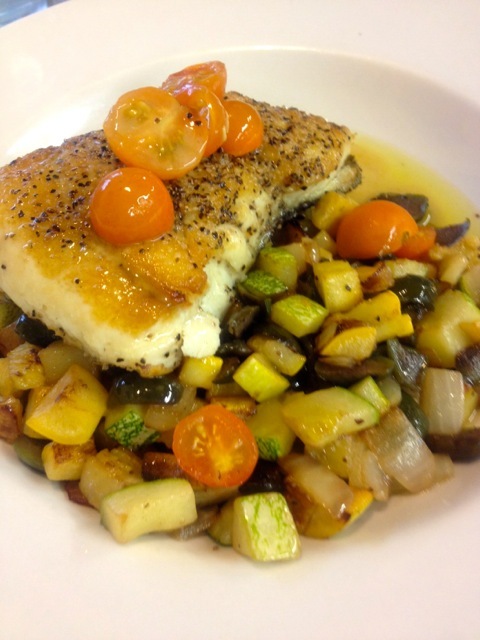 North Carolina fish was placed atop sauteed local vegetables in this dish. This pan-seared fish had a soft interior and crispy exterior, and just the right amount of umami flavor. The supporting zucchini, yellow squash, onions, and tomatoes provided textural contrast, color, and the organic taste of local farms. 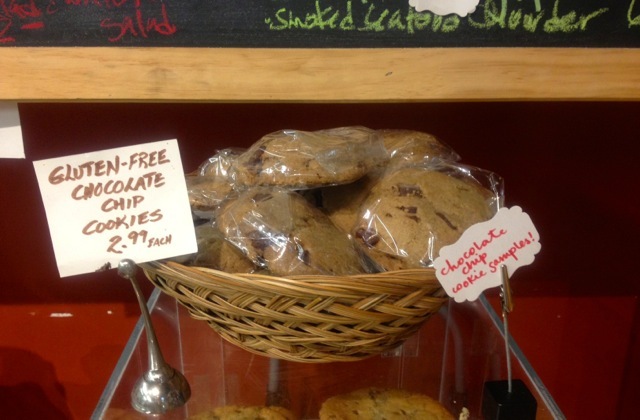 You can purchase goods from the in-store market for dessert, or find GF baked goods like these individually-wrapped GF chocolate chip cookies at the counter. Green Note: The Saxapahaw General Store is housed in a re-purposed gas station and convenience store (see pic by clicking here). This sign posted above the trash can encouraged us to leave food scraps on our plate rather than throwing them in the trash. 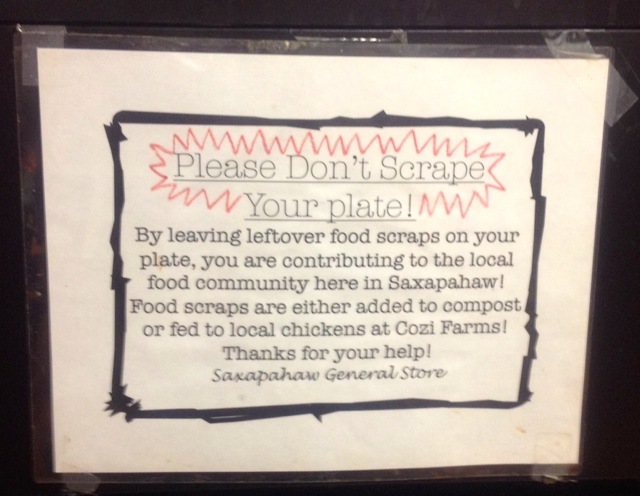 The staff will compost these scraps or help feed chickens at Cozi Farms. 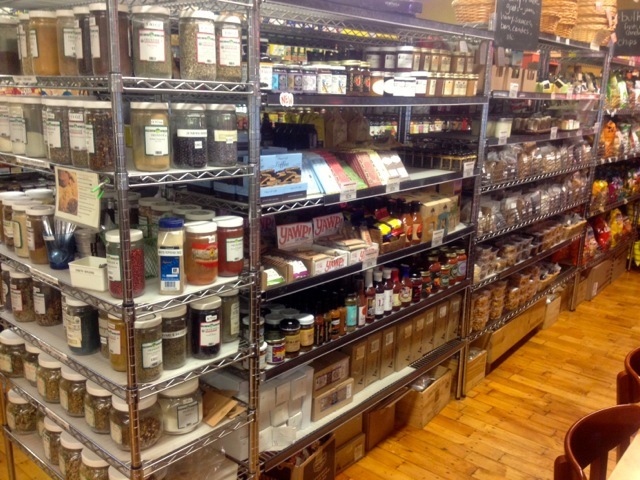 These store shelves are stocked with an bountiful array of NC products. Doesn’t it make you proud?